Golden Apples: See, See, I told you so! Here’s the Heart and Sole—blackjack color way. Somehow the pinkish part looked redder in the store--but no matter! 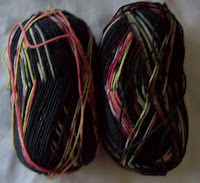 They will be mostly black socks, with some white and other colors.. They will match mostly black clothes (be they skirts, or jeans skirts (black not blue denim) or any of the other black that has snuck into my wardrobe and have enough color to keep them from being unbearable to knit. The color here is almost right( well on my monitor!) —but it's hard to see the lovely subtle shade and hues in this near solid.. a blend of merino and angora—its as soft as a cloud-and the lovely blue of a summers sky. 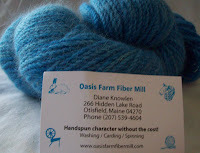 It really does have hand spun look—smooth and even, but not uniform in color or spin. A totally unexpected gift! Some one who knew I wanted to get to Rhinebeck (and didn’t) and bought it for me. It has such a lovely hand, I’d be knitting it this moment if I knew what it wanted to be—It’s already whispered lace—but what lace, and what shape the lace will take are still secret. The socks? 4 inches (of about 8) of the leg are done—most afternoons I get another 6 to 8 rounds worked. Some days more, some days—like weekends—less! I am thinking of continuing the pattern stitch on the heel flap. Yesterday I bought pretty pair of brown suede maryjanes- one of these new almost back less shoes (the back of the heel of the shoe is about ½ inch deep)—great for showing off fancy footwear! Oh, those blues are delicious! Just like a sky, you're right - not like the pale, silly colour some call "sky blue" at all! I'm eager to see the capelet blocked - it's a winner, Helen. Maybe your second "official" pattern? I agree with the sleeve notion - they're also good for measuring gauge and assessing the look and feel without doing the whole front/back.